During the Imperial Simulacrum of the late Third Era, Dragon Bridge was ruled by Princess Dorina. In the Fourth Era, the Penitus Oculatus kept an outpost in the town. 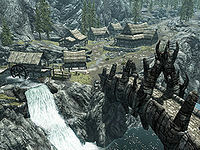 Dragon Bridge was also a stronghold for the Imperial Legion during the Stormcloak Rebellion. This page was last modified on 26 September 2018, at 14:09.